(Bloomberg) -- A $10 billion corporate-bond offering might be hard for investors to digest in some emerging markets. Not so in the Gulf, and not when the notes are being sold by the most profitable company on the planet. Though a contender for the highest rating from Moody’s Investors Service, Aramco’s state-owned status means it shares Saudi Arabia’s A1 sovereign credit score, which is five steps below the top grade. The yield on the nation’s 2029 debt is similar to that of lower-ranked Colombia and Panama, which could mean attractive pricing for a company that turned a $111.1 billion profit last year if the bonds are, as expected, placed at a small premium to the sovereign. 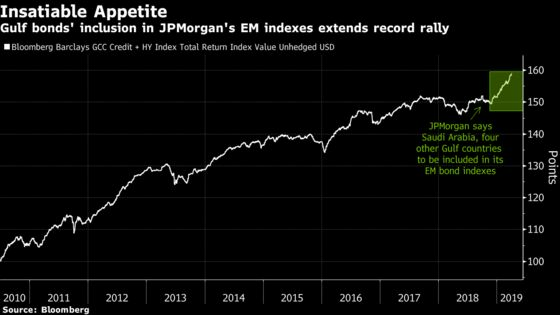 The inclusion of the Gulf region’s notes in JPMorgan Chase & Co.’s emerging-market indexes fueled a record rally in the first quarter and yields on debt of the six-nation Gulf Cooperation Council are still juicy compared with developing-nation peers. The Saudi 2029 bonds rose for a third day on Thursday, reducing the yield 1 basis point to 3.81 percent, the lowest since the notes were sold in January. Governments and companies in the Gulf sold about $33 billion of bonds this year, accounting for only 6 percent of the total amount raised in emerging markets worldwide. Saudi Arabia’s $7.5 billion bond sale in January attracted $27.5 billion in bids, while Qatar’s $12 billion offering was almost three times subscribed.